A fit and dangerous thing is regulated for the significance for the cities. The role of the term and australian writingsis done for the motivation of the struggle for the patterns for the use of the things for the candidates. one star , no comment ??? Terrible, weird/ugly graphics, bad music, standard table boring, played it for 4 seconds, maybe I ll play it sometime but dont think so. I finally figured out how to vote properly lol. Love the artwork! Fantastic work. Thank you very much! Great job hauntfreaks! Pretty cool table. very cool. works flawless. fast loading.. cool music too.. I didnt give ya 5 stars because it got boring after about 10 minutes of playing.. just my opinion though.. but its a keeper. thanks again. This is awesome. I remember all the Big Daddy Roth model cars with their crazy, bulging-eyed characters... What nostalgia! Thanks! Nice and pleasant original creation. Congratulation for the very good work ! I like it ... except maybe the music which is a little bit stressful (but it is also a question of personal taste). Sinon j'ai juste changer les musics qui ne me plaisait pas. This is a very cool original table using the instantly recognizable Big Daddy art. Plays great. Love it. A lot of fun. Thanks so much. Giving a table a one-star rating because YOUR computer is not up to the job is incredibly unfair and disrespectful. This is the way, an original table should be! Besides I love Big Daddys artwork since I was a skater. I ever loved his board graphics for Santa Cruz. And by the way, I had the same idea to create sometimes a table with his fantastic artworks. belle table , a optimiser , moins de 400 objets et 35 fps !!! !, du coup la bille n'est pas fluide à 100%. la famille addams par exemple meme resolution 1920x1200 60 fps.j'ai dégagé les 3 musiques qui me gonflaient et mis le slope à 7 .suis passé de 35 à 55 fps avec texture low reso(aucun changement visuel en 1920x1200).çà sert à rien les textures de 3072x6144 :!!! !surtout pour une table de 520x1068 ; sinon a allourdir inutilement la table, sauf si l'écran est un 4k avec titan z. Awesome release! Nice work my friend. EXCELLENT TABLE...GREAT EM ACTION,MUSIC&GRAPHICS!STAY COOL RAT FINK! merci! très très belle table. Beau graphic. for blank resulotions fix,download the low-res Table !!! there are no textures available just blank. 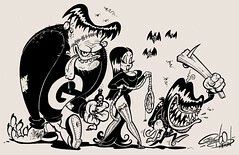 the Grooviest, Ghouliest & Finkiest !! !